According to old men at car meets, and the comment sections of Grateful Dead videos on YouTube, the sixties were an unbelievable time. Music was a driving force, the nascent space race, the birth of the bra-burning feminist, and the Chevrolet big-block established itself as a cruel weapon on the street. Rewind back to the 1964-65 New York World’s Fair, where the General Motors Futurama Pavilion was the largest exhibit in sight, with several unique aspects of the Corvette incorporated. There was the new Mako Shark II concept which would define the shape of future Corvettes, a cutaway ’65 Sting Ray fuel-injected coupe, and lastly, a cutaway Mark IV 396 engine. 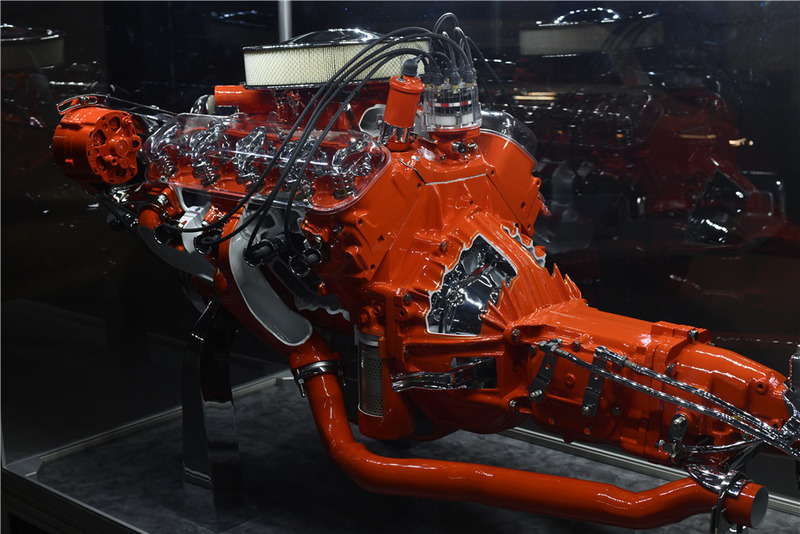 The 425-hp, 396 cubic-inch big block was to be introduced part way through 1965, and Chevrolet engineers were proud to boast that it would offer more horsepower than any other 396 engines, a crown it would wear until production ended in 1969. It was actually this engine that led to the demise of the Rochester fuel-injection system as the carbureted version cost much less. Ironically enough, the 396 Corvette cutaway engine and the “Fuelie” Corvette cutaway engine became obsolete almost as soon as they joined the Futurama exhibit: the “Fuelie” Corvette was not produced after 1965, and the 396 was immediately replaced by the 427 in order to keep up with the competition from Ford and Chrysler. As part of Barrett-Jackson’s upcoming January auction in Scottsdale, this unique Corvette cutaway engine from the Futurama World’s Fair display has been restored to its former show glory and will cross the auction block with a No Reserve tag slapped on. The Corvette cutaway engine display model is powered by a starter motor and features well-thought-out incisions to major components like the transmission bell housing, cylinder heads, and exhaust manifolds, in order to illustrate build quality and overall operation. It’s definitely a one-of-a-kind piece and it represents a highly unique time for both General Motors and the Corvette brand. The opportunity to look inside an incredible example of automotive engineering could make for an incredible addition to a living room, man-cave, or car collectors garage. GM and Chevrolet were at the height of their game. What happened? What are you talking about? The Corvette we have today is a better car than any C2 in any trim. Stop upholding everything from the past as being better than what we have today. It creates unrealistic expectations that we must put things like older Corvettes in glass jars and seal them away from the real world. Why have the Corvette at all if every time the engineers tried to improve the car to be better than what it was, someone one has to complain about it not perfectly emulating a Corvette from 50 years ago?